A best practice is a method or technique used to maintain quality as an alternative to mandatory legislated standards, and can be based on self-assessment or benchmarking. In the IT industry ITIL, COBIT, Lean, 6 Sigma, ISO and PMBoK are frequently implemented. For best practices to thrive, an environment must be created where best practices complement each other and the system of practices is in balance - The Best Practice Ecosystem. - For best practices to thrive, an environment must be created where best practices complement each other and the system of practices is in balance - The Best Practice Ecosystem. - Organizations that invested in best practices recognize significant growth and profit results compared to their competitors who did not invest in best practices. - Observe a case study of how a financial organization used the Best Practice Ecosystem to transform their IT organization. Service Management, Project Management, Risk Management and other operational disciplines will be examined. Are you currently using CobiT 4.1 and want to determine whether to adopt CobiT 5? Register now to join Manta Consultant, Peter Kingsman, as he takes at look at the changes and improvements in CobiT and how this affects Manta's approach to governance assessments. Have you been using ITIL for years and want to understand how to optimize your practices? Or are you just beginning with ITIL and want to know more about CSI? Register now to join Manta Director, Derrick Hazel, as he takes at look at ways to leverage CSI to drive operational efficiency, sustainment and customer satisfaction. Continual Service Improvement (CSI) supports changing business objectives by providing a consistently-applied set of processes, procedures and tools to measure, analyze and report on improvement opportunities ensuring maximum benefit and minimum risk to the business. When it comes to certified training, the Manta Group focuses on certain best practices - Service Management, Governance, Project Management and Emerging Technologies. Attend this webinar to find out why we focus on these best practice areas, and the different training delivery methods available - with a particular focus on why self-paced eLearning is a great learning option. As a special bonus, you will get a sneak peak into what the new CobiT 5 training will include. Everything you've always wanted to know about improving efficiencies and throughput with your PMO, but were afraid to ask. Using a Lean Six Sigma Project approach, Manta Director Gary Grandin provides insight to identify the gaps and increase efficiencies by using IT best practices. Do you find your IT organization in one of the following situations? Register now to join Manta Consultants Peter Kingsman, Eden Roberts and Craig Dewey as they present three key approaches to ensure your investment in ITIL and SM initiatives are addressing your key problems. Project managers have long faced the triple constraints of scope, schedule and cost. Yet too often when these hurdles have been overcome, the project might STILL be deemed a failure. Or the project might not add to the project manager's reputation. Why not? Project managers deal with delivery, procurement, and people puzzles, to name a few. While real, these are not necessarily aligned with the pain points of a Project Sponsor. The project is merely the cross section where the project manager's and sponsor's interests are temporarily aligned. We will explore the perspectives of the Project Sponsor, and assist project managers with strategies for working with sponsors of varying aptitude. This sometimes unwritten world may well hold the keys to project success, and the real results the PM is expected to deliver. Attendees can also collect a PMI PDU credit for attending this webcast through a Category B entry. Contact info@mantagroup.com for more information. Join Russ Conwath, Manta Consultant and Will O'Brien, CEO of The Manta Group, as they discuss the best way to create an efficient and effective service desk. Manta's assessment methodology is centered around four lenses: Services, Organization, Process and Technology. You will see proof of this methodology in the results from a case study where a service desk was improved at a financial institution. “Optimize Your Service Desk” is co-sponsored by The Manta Group (www.mantagroup.com) and MSI Inc (www.msysintegration.com). Are you looking for ways to improve the efficiency of IT services in your organization? Attend this webinar to see an example of Lean principles and how it can help your organization become more efficient and effective. This webcast provides an example of how Lean Thinking and Lean Principles were not only used to reduce waste and improve efficiency, but also as an approach to effective organizational change within a financial services company. As the amount of power consumed by IT continues to rise, the associated cost and environmental impact is becoming increasingly alarming. Power is already the single biggest operating expense in the data centre. However, much of this power is wasted, resulting in unnecessary heat, expense, and upstream carbon emissions. More and more companies are turning to the Cloud to host their confidential data, but are they taking the time to ensure the correct level of governance is in place? Get answers to your questions about Cloud governance in this interactive webcast. "Clouds are Fluffy and Safe?" is co-sponsored by The Manta Group and MSI. 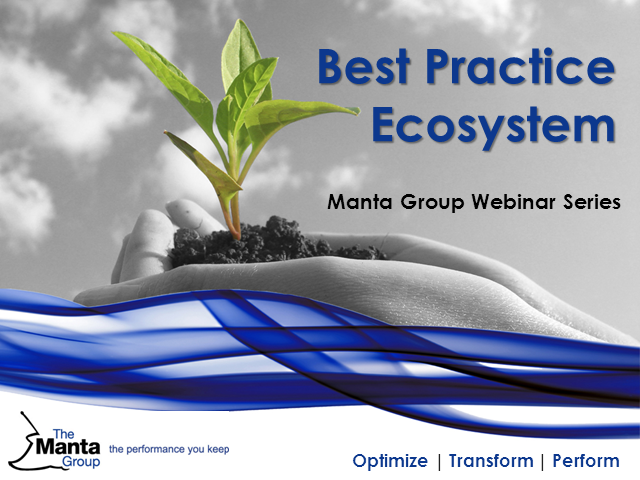 The Manta Group's free monthly webinar series is a valuable way to discover how to improve the efficiency and effectiveness of your IT organization. By watching our webcasts, you qualify for 1 CPD credit (per webcast) claim directly to priSM. Over the course of this series we will present insights on topics based in IT Business Performance, IT Management, Governance, Risk & Compliance and Enterprise Architecture. The Manta Group has been a trusted management consulting partner since 2003. Today our focus is on optimizing business operations, managing transformation and measuring performance over time. We look forward to realizing what's possible for you.